ServiceSpace is an organization run entirely by volunteers. They leverage technology to encourage everyday people around the world to do small acts of service. Their aim is to ignite the fundamental generosity in people, creating both inner and outer transformation. ServiceSpace was conceived by volunteers, was built by volunteers, and is run by volunteers — all for the benefit of volunteers. Their projects range from a daily positive news service, to an acts-of-kindness portal, to a gift-economy restaurant. Regardless of the endeavor, they act in concert to create service opportunities for each other and to support each other’s service journeys. 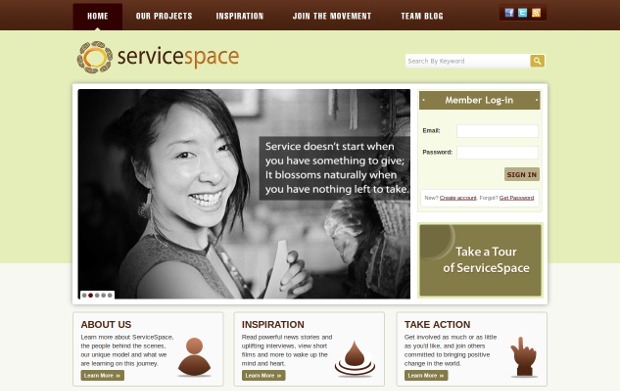 Founded in 1999, ServiceSpace was originally started to help non-profits with technical services. Over the past dozen years, the organization has become an umbrella for many generosity-driven projects. Thus they have expanded our services from focusing just on helping charities, to encouraging everyday people to contribute in meaningful ways to the world around them. Nipun Mehta, the founder of ServiceSpace, is an incubator of projects that works at the intersection of volunteerism, technology and gift-economy. What started as an experiment with four friends in the Silicon Valley has now grown to a global ecosystem of over 400.000 members that has delivered millions of dollars in service for free.